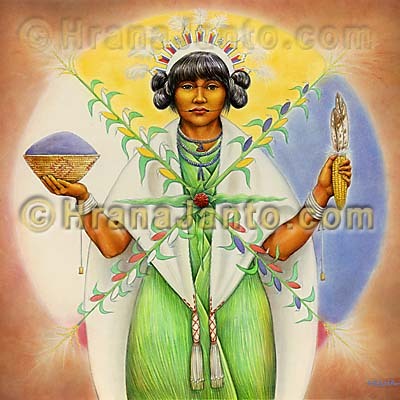 I painted Corn Maiden in 1992 for Llewellyn's 1993 Goddess Calendar. She is included in the Goddess Oracle. Uti Hiata is the Pawnee name for "Mother Corn," one of the most important divinities of the Plains Indian culture. Their neighbors, the Arikara, told the Corn Mother's story in detail. From the great blue lake of creation, diving ducks brought up bits of silt to build prairies and foothills. Sky father Nesaru, seeing giants populating the earth, sent a great flood to destroy them; he replanted the earth with maize seeds, which sprouted into human beings. Then he sent Uti Hiata to assist at their birth. Finding no one on earth, Uti Hiata walked and walked. Suddenly the thunder kidnapped her and hid her beneath the earth. There, she gathered the underworld animals-the mole, the mouse, the badger-and with their help dug through the ground and burst out into the sun. As she emerged, so did the people of the plains, to whom she taught secrets of life and magic and the methods of agriculture and of religious ritual. Satisfied that humanity would live in abundance, she disappeared from the earth, leaving the cedar as an emblem of her existence.